Science could still save this endangered species. No one can say Sudan, a northern white rhino, didn’t live a full life. He was the subject of countless works of art. Famous actresses and heads of state traveled across the globe to meet him. He even had his own Tinder profile. But Sudan’s death this week, at the ripe old age of 45, is tragic for another reason: He was the last living male of his subspecies. When Sudan was born, in 1973, researchers believe he was one of about 500 northern white rhinos. By the mid-80s, poaching slashed that number to about 30. After a slight recovery around the start of the twenty-first century, the population soon dwindled further, down to just eight in 2007, and then three in 2015. In 2009, his caretakers moved him from the Czech Republic to the Ol Pejeta Conservancy in Kenya, in the hope that an environment more like his natural habitat would prompt Sudan to breed. In his last days, Sudan suffered from age-related health conditions. So on, March 19, veterinarians made the difficult decision to euthanize him. Sudan leaves behind two female family members: daughter Najin and granddaughter Fatu. Neither is healthy enough to carry a birth to term. And they are now the last living northern white rhinos on Earth. A subspecies reduced to two female rhinos doesn’t bode well for its continued survival. But all hope isn’t lost. Researchers saved the sperm from Sudan, and from four other male northern white rhinos before they died. And they think they might be able to produce a calf via in vitro fertilization (IVF). Here’s the plan. First, the researchers would fertilize one of the female rhino’s eggs with the frozen sperm. The team could then use a female of a closely related species, the southern white rhino, as a surrogate. Najin and Fatu have a limited number of eggs, so that might not work. But there are other options for saving the species. Scientists could potentially transform northern white rhino skin cells into stem cells. After that, they could coax those stem cells into eggs. They’d then fertilize those the same way they would if they came from Najin and Fatu. Since the last two remaining northern white rhinos are closely related, we’d need some way to diversify the subspecies if we did hope to regenerate the population. The stem cell option would help with that, as scientists could transform any samples from any of the deceased rhinos into eggs or sperm. Of course, all of this would be very expensive, in the $800,000 to $10 million range per cycle. Some conservationists argue we’d be better off spending that money elsewhere. We’re in the midst of a mass extinction in which dozens of species go extinct every day. 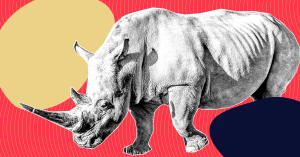 What makes the northern white rhino so special that we bring it back from extinction? Some scientists think Earth has a “boundary for biodiversity.” Genetic diversity helps the planet cope with change, they claim. Too few species, and the Earth loses this ability. Ultimately, biodiversity loss could jeopardize humanity’s “safe operating space” on Earth, Johan Rockström, the executive director of the Stockholm Resilience Centre, told The Guardian. Other researchers think the idea of a biodiversity boundary is nonsense. They argue that species loss is more of a slow burn, degrading ecosystems over time. So, on one hand, the extinction of the northern white rhino could put us one step closer to a “tipping point” of sorts that leads to the end of humanity. On the other, it could contribute to the planet’s ecological death by a thousand cuts. Neither option sounds great. But if charismatic species like the northern white rhino result in real action, perhaps we’ll never have to find out which is right.